Model SAMUS725M and its difference from samus725G. Each unit is protected with individual password which enables the unit to work after its insertion. After connecting to the 12 VOLT only battery + and – you have the display ON and must press any key to insert the password. It is easy but may seem to be complicated at first. Let's say we have 901005 password in our unit - this is only example. 3)Chose by first button up and down the number 1 and pass further to the last position. The point after the digit shows us at which number we are situated. Set the 5 on the last position. 4)We have 901005 password set and now CONFIRM with the last button MOD. 5)The unit will show GOOD LUCK !!! and the basic window will show up. See further below. The device samus725M has a few differences from samus725G – a few improvements !!! t- time for reduction ( 3,6,9 or 12 seconds) . You set the time and in first second of the time you get highest power level and then in the course of time it is being reduced and in the last second it is reduced by maximum,set by YOU, percentage ( 30%,60% or 90%) any by chosen by YOU parameter – F or L or F and L together. Power reduction mode- THE MOST ADVANCED TECHNOLOGY IN ELECTROFISHING !!!! 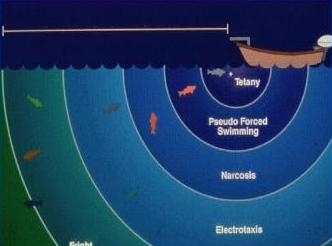 Under influence of electric field produced by electrofisher the fish may come into a few states from fright to electrotaxis ( galvanotaxis) to narcosis and tetany depending on the distance from the net. This is caused by the fact that electric field spreads out in the water not equally. The highest density of electric field is around the net and quickly diminishes with the distance. The so-called zones make the fish pass through a few states while approaching the net. The best is too keep the fish in minimum shock in order to keep it very lively and enable smooth swimming towards the net. In order to keep the best state of the fish under electric field influence and enable the best swimming and shocking of the fish POWER REDUCTION mode gives excellent results in most conditions. It produces less shock to fish and makes the fish goes smoother to the net, do not sink at the net in the last phase . It also has a benefit that the battery lasts longer and you may use smaller and less heavy battery. 2,5 kg -7 Ah may be enough for 1-2 hours of electrofishing. 45 Ah car battery is enough for 20 hours of electrofishing. The idea of it is based on it that the fish,when comes to the net ( ring), receives in standard modes ex. F-75 and L-0,30 and P=150 more power when it comes to the metal ring ( net). When the fish moves towards the anode it is approaching the zone with more and more power. The closer to the metal the stronger electric field in water is. .But in theory the power should be reduced as the fish is already shocked. The fish should move to the net more smoothly and receive less power during the course of time. It is often difficult for beginners to set appropriate power levels on OPTIMUM MINIMUM which means you get effect of galvanotaxis ( drawing the fish towards the net) and effective electrofishing. Often the power is too high or too small. Now computer programming allows this. In the last second by reduction of 90% you will get reduced power and still shock but as minimum as possible only not to allow the fish to escape. However, you must pick the fish quickly to the net, though. So the fish comes to anode ( net) and receives less power not to be hurt and only units with microcomputer may do it and only we and USA smith-root models of devices have it available. You also set time 3, 6, 9,12 seconds you want reduction to last. So in the first second you have higher power and later lowered by microcomputer until end value and it lasts until you release the button START - micro switcher. It is counted so that at first you have , let's say 190 watts of power at F=75 L-0,35 or so and P=190 watts so while setting 6 seconds (t) in the last second (6th) and later we will have 100 watts in case of 90% reduction . S90 means 45% reduction of frequency and 45% of duration. If L is enough higher than 0,05. Other options are 15 % and 15% in case of S30 and in case of S60 we reduce power by 30% both F and L. F30, F60 and F90 means you reduce only 1 parameter and L30 L60 and L 90 means you reduce only L if it is enough over 0.05 value . We have 9 ( nine) options now but it can be added later of course but it makes the unit complicated to set and choose from settings. There are hundreds options possible to be programmed. S1, S2, S3, S4– how to remember the settings for the next fishing trips ? Just press last button MOD for 1 second and you will pass to another S2 and again press for 1 second and then pass to S3 and again to S4 and back to S1. Now when you disconnect from the battery and enter the password again you will have the last settings stored in microcomputer memory. There is also another window you may notice ( pressing MARKER forward and back) but it gives only service and counters settings. Power Time and general field work. For the rest you can follow samus725G advises and all other safety and operation issues.